Seat TCR updated V1.2, I guess we´re driving the actual version next week ? (03-29-2018, 07:41 PM)Michael Martin Wrote: Please don't change anything in the race. Made it very interesting and great fun! Hey guys, the pit stop during Round 1 of my series was not intentional. SRS had the fuel locked at 20 litres which caused many drivers to run out of fuel or pit for fuel. 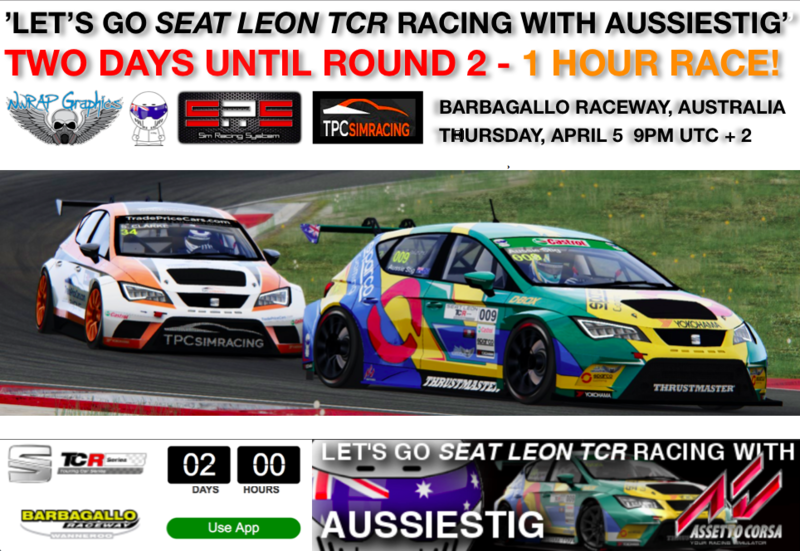 The next race at Barbagallo will be a 1 HOUR race with mandatory pit stop. The remainder of the series will have open fuel loads, drivers may choose their own fuel levels per race. (03-31-2018, 06:51 PM)Matthias Rudolph Wrote: Seat TCR updated V1.2, I guess we´re driving the actual version next week ? Any Information regarding V.1.2 @Simracingsystem ? Would be a disappointment when someone´s got the wrong car. It was a fun mistake Mark. Even though i liked it it does make sense to have no pit stops in the short races. Will there be a set pit window or is it open? +1 to if we need the new car or not. (04-03-2018, 04:54 PM)Michael Martin Wrote: It was a fun mistake Mark. Even though i liked it it does make sense to have no pit stops in the short races. Thx Mr. Stig , looking forward to tomorrow. Thanks for all the clarification. Looking forward to Thursday.